This famous and exceedingly rare (in the United States, at least) was a treat and something I sought out on a recent trip to Belgium. The brewery recently released a collectors pack featuring a few bottles and a glass in the United States and sold like hot cakes. Unfortunately, none of those packs were even available in Connecticut, as the importer apparently doesn't find the state worthwhile for such beer. Westvleteren is one of seven Trappist brewers (Chimay, Orval, Rochefort, Westmalle, Achel, and La Trappe being the other names familiar to beer drinkers), but is among the rarest with second lowest production (lowest being held by Achel -- according to numbers published here). 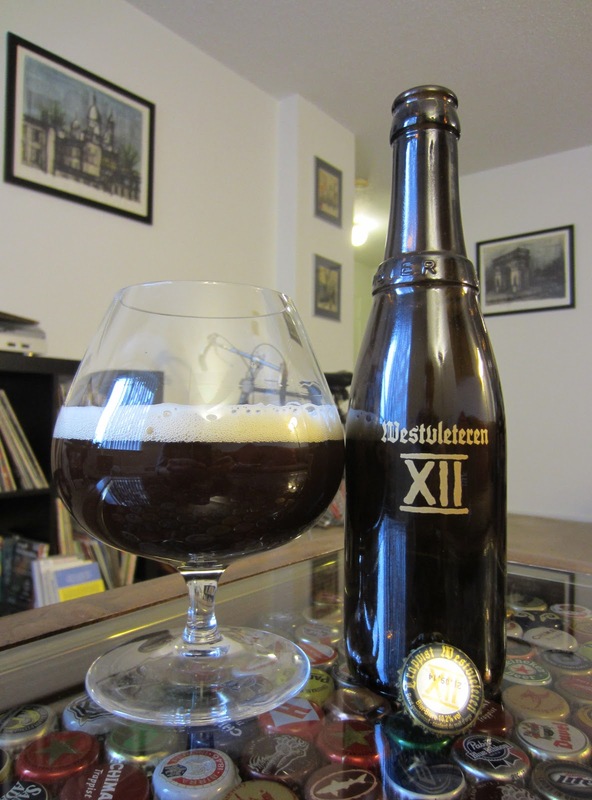 The Westvleteren XII is perhaps the most iconic entry by the brewery and stands tall at 10.2% ABV as a Belgian Quadruple. It pours a hazy, if not murky, chestnut brown from its signature bottle featuring the moniker "Trappistenbier" on a band around the shallow sloping neck. The beer's head ia a healthy light brown foam and musters a fair retention considering the strength of the beer. It does, however, leave a thin layer on top of the beer for the entire drinking session. The nose is extremely bready, but somewhat understated initially. Light pumpernickel features atop an alcoholic sweetness. The toasted malts subside on the backend to dark sugars and caramel notes that reveal winter fruits like dried figs and a hint of nuttiness. A dash of spice leads up to the lightly medicinal finish of the aroma. The beer is strong and boozy. Light carbonation builds waves of velvety texture in the mouth and breaks up the sweet alcohol with an airy evaporation on the tongue. Brown sugar with a dank cellariness defines the beer with a syrupy classic Belgian edge. Deep sweets from dark fruits pair with a light fruit meatiness. Hints of plum and currant combine with the light sweet edge of raisins and produce a hint of Port. The grainy pumpernickel bread is prominent near the finish and features the lightest hints of caraway seed and even a dusting of flour. The finish is clean with a pronounced, yet refined alcohol that heats the chest. The fruity sweets fully subside and welcome in a powdery dryness and leaves the beer's spicy hints behind. Often trumpeted, perhaps fueled, at least in part, by its rareness, as the world's best beer this is an absolute must try. Unfortunately very difficult to find, this beer is worth waiting for or seeking out and a requisite part of any trip that brings a dedicated beer drinker to Belgium.